Visible crew/equipment: When Alan and Lora go to see Kevin Flynn at his game room they find him playing his videogame 'Space Paranoids'. After he finishes playing, he turns around to talk with Alan and Lora. As they are speaking you can see the microphone coming up from the bottom of the screen. It even hits Kevin Flynn in the hand. 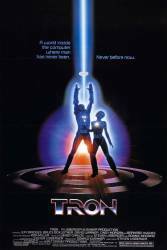 Continuity mistake: When Tron fights off Sark's men as they board the Skyship, watch for the soldier who falls off the side just after Flynn. It's obviously a still rather than an actor as only a pair of non-moving legs fly past the ship. It's an editorial mistake as had the character been "derezzing" (deresolution) he would have glowed yellow and faded which did not happen here. Continuity mistake: When Flynn, Tron, and Ram are in the lightcycles, most of the time the cycles are red, yellow, and orange. However, in one shot where the 3 of them have left the game grid and are speeding away from their pursuers, the cycles are shown as red, yellow, and green. [This has been corrected in the special edition re-release.]. Continuity mistake: The Acceleration Stick Flynn uses in the Recognizer goes from flat side forward to edge on and back. Also, in a shot from behind, the background appears through the stick just before Flynn crashes. Revealing mistake: When the first of the blue bikes hits the wall and makes the hole, there is a rubber tyre bouncing away from the explosion. Any time that you see the back wheel of the cycles, there is no rubber tire. This is supposed to be the digital world. Even the tanks, with all the accompanying sounds does not have rubber on the tracks, as there are no tracks. Continuity mistake: From the Light Cycle grid, the hole in the wall made by one of the Blue bikes has a jagged side like the teeth of a saw blade on the left side, and a couple of squared projections on the right. The hole goes all the way through to a tunnel on the other side. When the trio escape, and exit out into the tunnel, the hole has the saw-tooth jagged side on the left instead of the right. It should be a mirror image of the Grid side of the hole. Continuity mistake: When Sark is looking at his display and wants the programs back, the display is about the size of a forty-six inch LED TV screen. When the shot changes to a wide shot, the display takes up the whole wall. Other mistake: As the guards lead Flynn away after the Ring Game, the rings disappear, and as the trio is heading up the walkway, you see the paths disappear from the ring end up. The speed that it was dissolving would have caught the second guard, and he would have fallen and derezzed. Other mistake: In the Ring Game, Flynn throws a shot that Crom catches and returns. When the shot hits Flynn's rings, it takes out the third and fourth ring. Problem is that any other time, the impact only takes out the ring that it hit. Close inspection shows a solid hit on the fourth ring only. The only explanation is that since Flynn continues and jumps the "gap" in the rings, this was a deliberate set up to bring the end to this sequence and move the movie forward. Revealing mistake: When the guard on top of the cells is ushering Flynn out, you can plainly see his shadow cast on the solid floor. The action below is obviously superimposed. Continuity mistake: When Alan is typing to get access to TRON, his hands are reflected in the screen. When he's done typing, his hands and then his arms move back to a relaxed position. When the camera cuts to his face you can see his shoulders move as his arms are pulled back from the computer to a relaxed position again. Revealing mistake: When Alan gets up to go to see Dillinger, look at the cubicles. The first row that Alan came out of is real. In the immediate next row, the cubicle that is adjacent to Alan's has no visible exit, and the two that would be heading toward the white wall seem to be only leading to each other. The rest of the cubicles in the area are all a matte painting used to extend the set. Revealing mistake: With the exception of the set up and ending "real world" sequences, this is all in the digital world. There is no sun, yet when Tron, Flynn and RAM are drinking at the pool of energy, there is a reflection of what appears to be a plaza and a bright day outside the windows. Yori: What good will that do? Kevin Flynn: I'm gonna jump! It's the only way to help Tron. Yori: Don't! You'll be de-rezzed. 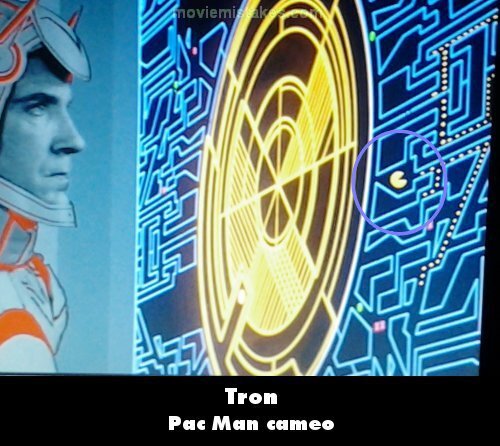 Just after Tron pulls Flynn up onto the solar sailor, there is a shot of the landscape below. A hidden Mickey Mouse head can be seen in a nod to the Mouse House.